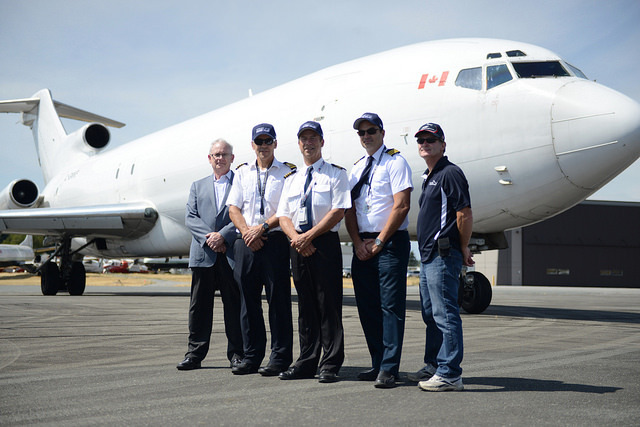 ABBOTSFORD – A large, loud donation touched down at the Abbotsford International Airport July 15, when the University of the Fraser Valley received a Boeing 727-200 jet aircraft donated by KF Aerospace (formerly Kelowna Flightcraft). 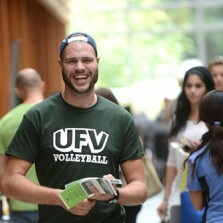 The 727 will be utilized by the next generation of technicians training in UFV’s aerospace programs. After nearly 40 years in service, the aircraft will provide a real-world learning environment for trades skills training critical to the aviation industry. The jet will be utilized by students as they learn aircraft structure repair, maintenance, assembly, and modification. This particular 727 has been a flying workhorse since entering service in 1976. The three-engine jet has completed over 45,000 flights for several airlines including Air Italia, Continental Airlines, Purolator, and KF Aerospace, where it was primarily used to service Purolator. Retiring into a learning environment is a fitting conclusion to its airborne career. Repositioned to YLW on April 2, 2015. Founded in 1970 by Barry Lapointe and Jim Rogers, the company began providing maintenance services to aircraft in Western Canada, and now provides a wide range of aviation services to corporate, commercial, and military customers worldwide. KF Aerospace is extremely proud to be a strong contributor to the Canadian Aviation community for 45 years. Headquartered in British Columbia’s Okanagan Valley, KF Aerospace is privately owned and one of the top aviation service providers in Canada. With nearly 1,000 highly skilled employees in locations across Canada, the company provides air cargo operations, aircraft leasing services, heavy maintenance and modifications, and pilot training. KF Aerospace Defence Programs trains 80% of Canada’s Royal Canadian Air Force pilots in Multi-Engine and Rotary Wing, and oversees all aspects of training and facilities management at a location in Portage La Prairie, MB. As the Type Certificate holder (OEM) for the Convair twin engine aircraft, the company provides 24-hour technical services, parts and support.